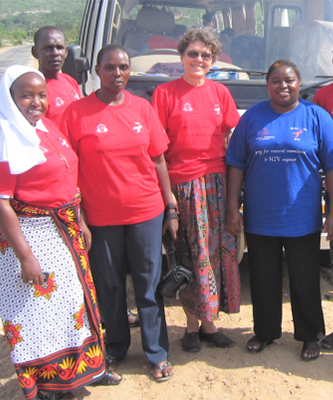 Maryknoll Lay Missioner Susan Nagele (fourth from left) on World AIDS Day in Mombasa, Kenya in 2010. Mary was as skinny as a rail. Now 20, she was orphaned many years ago when her parents died of HIV/AIDS. We had been trying for years to get her tested to know if she, too, was infected. She was a bright girl who scored well and went to a prestigious high school on scholarship but she couldn’t find a job. Unemployment among young people in Kenya is about 50 percent. Mary had been volunteering at St. Patrick Dispensary in the informal settlement called Bangladesh in Mombasa, Kenya, where she was given a little money for transport and lunch. One day, Mary came to work very sick. She was so poor she couldn’t afford to miss working for a little food. I again asked her why she was so afraid to be tested. She said that if she was positive she would feel terrible. It would mean that she was infected by her mother and everyone would know. I talked about bad luck, a loving God who doesn’t judge and the real problem, which is people who judge. She shouldn’t let them make her feel bad. I told her that if she was positive we have medicines to make her stronger and healthier. In my desperation I told her that I am sick too and have to take medicine four times a day. I thank God that there is medicine to help me. All of the sudden she said OK. I went quiet. She told me that she wanted a certain person to test her, and she didn’t want anyone else to know the result. The test came out negative. Mary was skinny because she was poor and didn’t have enough food. The United Nations has set a target to diagnose 90 percent of people infected with HIV by the Year 2020. Currently only 70 percent of infected people know their status. Stigma and fear are major reasons why people like Mary refuse testing. At the Uzima Centre in Mwanza, Tanzania, a major concern for HIV-positive clients is their diet. Paulina prepares flour for them—a combination of ground corn, rice, millet, sorghum and peanuts. Here she is preparing the peanuts. Mary’s poverty confirms the experience of Joanne Miya, a Maryknoll Lay Missioner in Tanzania. She works at Uzima Centre in the city of Mwanza, which provides education and counseling for HIV/AIDS. The majority of problems they encounter are due to poverty, not HIV infection. On any given day, the Centre struggles to find a boy with HIV a bicycle so he can go to go to school; to help a mother find her HIV-positive daughter who is working as a prostitute; to assist an HIV-positive grandmother who has no income and is raising her grandchild. In Kenya, the Ministry of Health has adopted the World Health Organization guidelines for self-testing, and kits are available in pharmacies for $2 to $15, which is very expensive. Initial fears that people would react negatively and commit suicide have been unfounded. Thousands of people have used the kits successfully. The Ministry of Health plans to make them free in government facilities. Father Rick Bauer is a Maryknoll priest who works with the Eastern Deanery AIDS Relief Program in Nairobi, Kenya. He is working with the World Health Organization and donors to make the kits available free of charge in faith-based organizations, too. The key to HIV self-testing is to link people with positive reactive home tests to clinics that can perform confirmation tests and follow up with care, treatment and support. Many of the implementing partners have limited resources to go into the communities. The Eastern Deanery AIDS Relief Program has over 1,200 community health workers who know their communities and can provide this needed link. The city of Nairobi will mark Universal Children’s Day on November 20 with the theme Ending AIDS and TB in Children and Adolescents. After a Procession and an Interfaith Prayer Service, Faith leaders will lead by example with voluntary testing. There will be voluntary counseling and testing for youth and a workshop on HIV self-testing for faith communities. Children and youth will be encouraged to write letters to the government, the First Lady and pharmaceutical and diagnostic companies requesting improved access to HIV and TB information, testing and treatment. Fr. Bauer is a main coordinator of this initiative among faith-based organizations. In Tanzania, the government occasionally gives HIV education on the radio and the local government “AIDS Committee” shows little interest, initiative or awareness when they visit the Uzima Centre. There has been no promotion of HIV self-testing and little preparation for World AIDS Day. There is no knowledge of Universal Children’s Day. There is great disparity between the programs of these two countries. Fear, stigma and poverty are the scourges that prevent people from knowing their status. Maryknoll and other faith communities are leading the way. On December 1, join the 24-hour vigil organized by the Maryknoll Office for Global Concerns to pray for those living with HIV and AIDS and for those whose lives were cut short due to HIV or AIDS. Add your name and the time when you wish to pray on December 1 to the list at http://bit.ly/AIDSDayprayervigil. Dr. Susan Nagele is a Maryknoll Lay Missioner and a family physician who returned to the United States in July from East Africa after 33 years of service. This article was published in the November-December 2018 issue of NewsNotes. Top photo courtesy of Dr. Susan Nagele, second photo courtesy of Joanne Miya.